TEPCO published a photo with a short explanation and no handout document. The image shows what TEPCO describes as a drilling rig. Based on the appearance of the background objects this appears to be seated against the CRD hatch inside unit 2. This location has been the selected site where a robot will be inserted into unit 2 containment to collect data and images. This work has been repeatedly delayed after shielding blocks were found difficult to remove. Then, discovery of high radiation levels where the hatch gasket had melted away caused further problems. The drilling rig displays logos from IRID, Toshiba and IHI. IRID being the decommissioning research and development group. Toshiba is heavily involved in the inspection and response work at the site and was a prime contractor at Daiichi before the disaster. IHI corporation does a variety of high tech work including the energy and aerospace industries. IRID has provided no reports on this rig so little is known about the capabilities. To be able to conduct the containment inspection workers will need to insert a robot into the CRD hatch tube. Drilling out an opening on the hatch rather than attempting to open it was decided early in the process. Similar efforts at unit 1 involved connecting a large tube shaped rig to the containment port that acts as a hot cell. 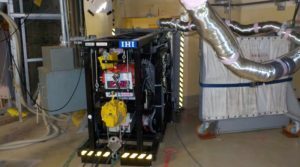 This allows the robot to enter and exit the containment structure without allowing radiation or radioactive materials to escape. Earlier reporting of practice work for unit 2 showed workers training with a similar hot cell unit. TEPCO had announced that they hoped to begin the process of inspecting unit 2’s containment structure in early 2017. This new development is a good sign that they may have overcome the challenges that caused delays since 2014. A larger version of the image released by TEPCO can be found here.